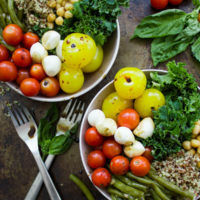 This colorful Protein Bowl is packed full of good-for-you ingredients, like chickpeas, kale, tomatoes bocconcini cheese and quinoa and then drizzled with an easy basil-scented balsamic dressing. A healthy protein-packed meal that can be prepped ahead of time. There are days when I find myself craving a bowl of goodies piled together and call it dinner. Yesterday’s dinner was Balsamic Quinoa Chickpea Protein Bowl. SO GOOD. There are so many flavors and textures going on in these healthy Protein Bowls. 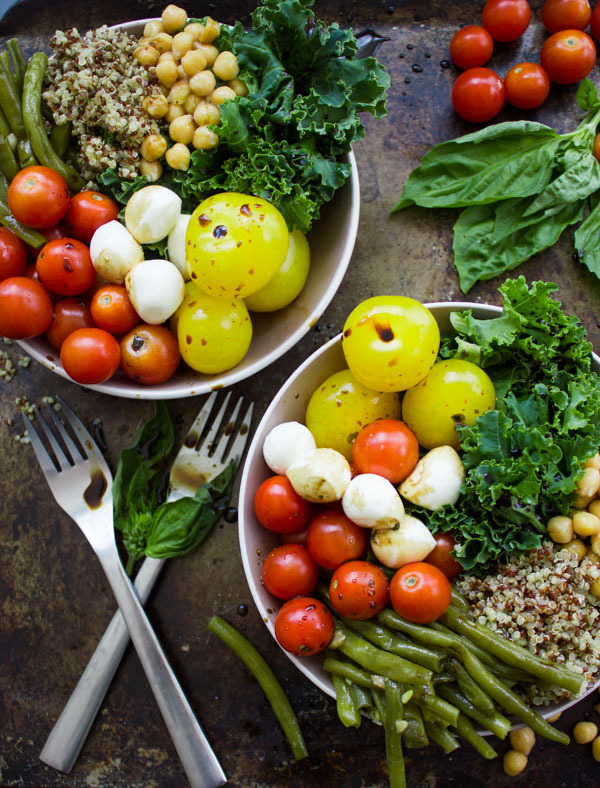 So much goodness from the quinoa, chickpeas, green beans, kale and tomatoes. A simple basil infused balsamic dressing is all this protein bowl needed to make the flavours pop. If I was making this bowl in the summer, I would probably swap that basil balsamic for a basil lemon/citrus dressing, but that’s just me dreaming of sunshine right now. Lately, I’ve been making SO many healthy protein bowls like this one with chickpeas. Do you remember those killer GOOD lentil Fall Harvest Buddha Bowl? I made them quite a bunch of times too. Today’s protein bowl is more of a salad, maybe quinoa salad, or kale salad. The base for these healthy Protein Bowls is quinoa. I know it sounds like quinoa is like old news now, but I seriously LOVE it for that chewy bite and neutral taste. If you’re still figuring out quinoa—you can read this post on How To Cook Quinoa for a foolproof way and tips. I’ve also added some sautéed green beans. I buy a huge bag of frozen beans and when I feel stuck or rushed I reach out for them always. They’re so quickly sautéed from frozen with a bit of garlic, salt and olive oil (or butter if you’re in that mood). Other than beans and quinoa, my protein bowl has also chopped kale (any greens work great! ), some tomatoes, and bocconcini cheese (skip this if you’re making these bowls vegan). Then for extra protein, I added chickpeas. Love the taste, texture and pure protein it adds to the protein bowl. For making the salad, start with the green beans. Preheat a skillet with olive oil to medium-high heat and add in the garlic and green beans. Sauté them for 2 minutes and then cover the skillet. Lower the heat and let the green beans cook for 8 minutes or so until done. 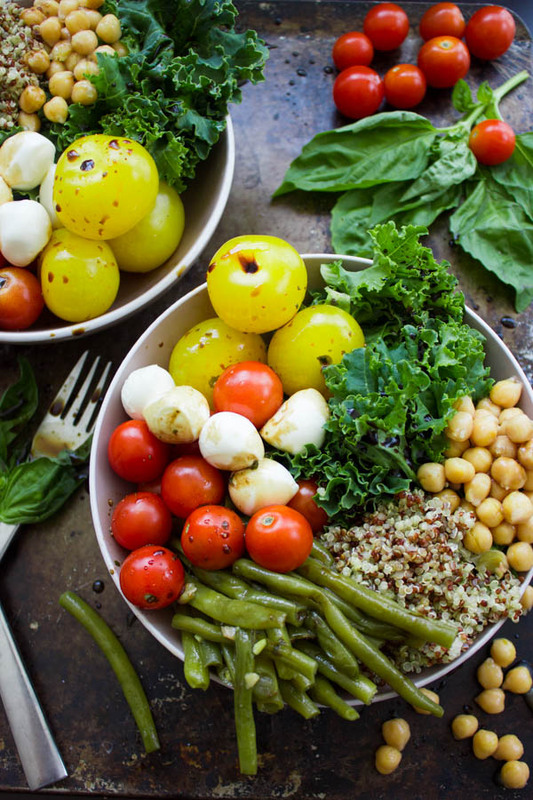 Assemble the protein bowls, add the quinoa on a side, then the kale, green beans, tomatoes, bocconcini and chickpeas. The dressing. It’s all about the balsamic dressing. Simple, sweet, warm and it goes so well with the Italian flare. To make it, place all the ingredients in a small container and place the lid on. Shake the container very well until blended and emulsified. Try adding some lentils, nuts, herbs, avocados or cucumbers to adjust these Chickpea Protein Bowls more to your taste! I like making huge batches of quinoa and store it by the cup in a ziplock in the freezer. Whenever you need some quinoa, simply take that bag from the freezer, thaw it for a couple of hours on the counter and then reheat it a bit in the microwave. Adding lemon or orange juice to the dressing along with garlic and basil is another great summery twist. Also awesome is this Perfect Tahini Sauce or a creamy Avocado dressing like in this recipe for Shrimp Salad with Avocado Dressing. 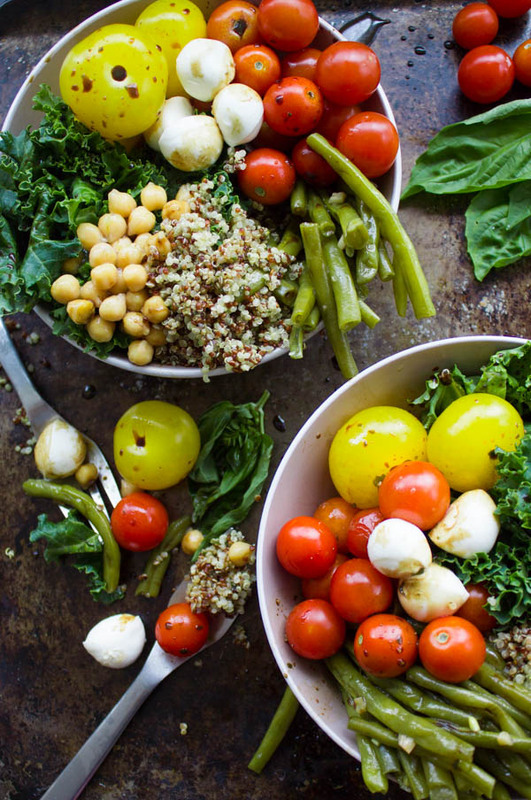 This colourful protein bowl is packed full of good-for-you ingredients, like chickpeas, kale, tomatoes bocconcini cheese and quinoa and then drizzled with an easy basil-scented balsamic dressing. A healthy protein-packed meal that can be prepped ahead of time. Cook the green beans. Preheat a skillet with olive oil to medium-high heat and add in the garlic and green beans. Sauté them for 2 minutes and then cover the skillet. Lower the heat and let the green beans cook for 8 minutes or so until done. 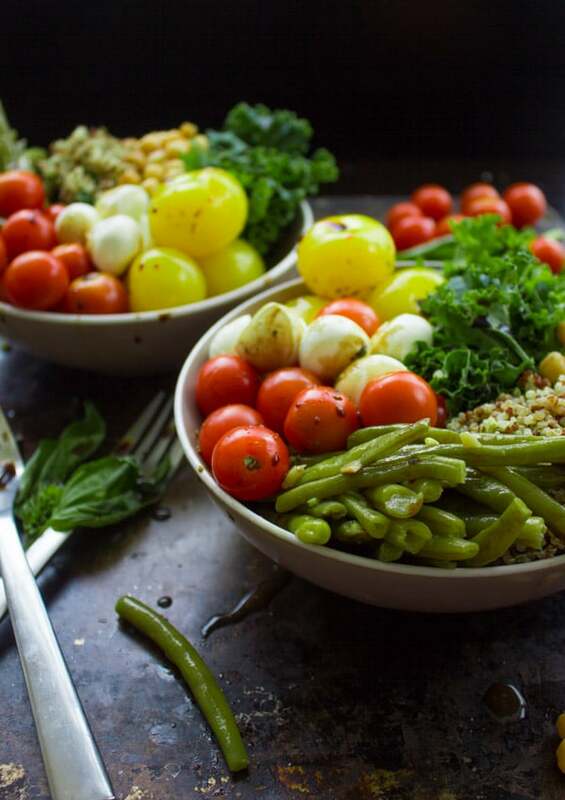 Assemble the bowls, add the quinoa on a side, then the kale, green beans, tomatoes, bocconcini and chickpeas. Place all the ingredients in a small container and place the lid on. Shake the container very well until blended and emulsified. Drizzle 2 tablespoons (more or less) of the salad dressing over each bowl and keep the rest of the dressing in the fridge for a month. Oh my this looks healthy and yummy! OMG! 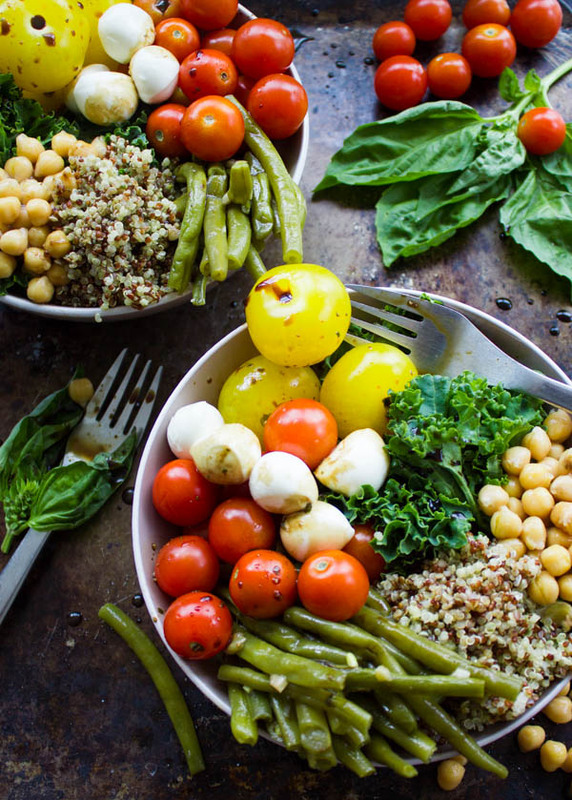 All these healthy and delicious things in a bowl! Yum! This is really delish! And packed full of amazing flavors! This has my full attention! Love everything in this! Thanks so much for this simple, fresh and healthy idea. I made it the other night, and the flavors blended so well. I used spinach instead of kale, and since my hubby doesn’t like garbanzo beans, I left those out. Topped it off with some baked salmon. I wasn’t sure of the green beans, but they really worked. The simplest things sometimes are the best! !